KATHMANDU, April 27: The 14th International Trade Fair and Cottage Industry Festival 2018 began in Kathmandu on Friday. The fair is organized by the Federation of Nepal Cottage and Small Industries (FNCSI). Ministry of Industry, Commerce and Supplies, Trade and Export Promotion Centre (TEPC), Micro, Cottage and Small Industries Development Fund, Department of Women and Children, and President Women Empowerment Fund (PWEF) are the co-organizers of the festival. Similarly, Kathmandu Metropolitan City Office is supporting the event. 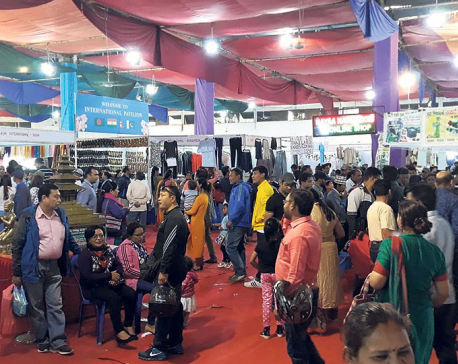 The five-day expo is being held at Bhrikuti Mandap Exhibition Hall with the objective of promoting goods produced in Nepal and showcase Nepali products in the global arena. The festival will continue till May 1. “We are organizing this festival to promote trade and export of Nepali goods as well as acquaint Nepali entrepreneurs with entrepreneurs from South Asian countries like India, Bangladesh and Pakistan. I believe the fair will play a key role in promotion of small and cottage industries of Nepal,” Mohan Katwal, the coordinator of the festival, told Republica. Former Prime Minister, and Chairman of CPN (Maoist Centre), Pushpa Kamal Dahal, inaugurated the festival. Speaking at the program, Dahal emphasized the need to expand cottage industries and also stressed on the importance of agro-based cottage industries in Nepal. “Cottage industries are the foundation for industrial development of the country. Unless cottage industries are developed, industrial development is not possible,” he added. He further added that as the exhibition is being organized when the country is preparing budget and necessary framework for all levels of the government, it will be easier for the government to address the needs of the country's industrial sector. Dahal further said that he would request the government to establish at least one rural industry in each local unit with investment of around Rs 10 million each. The federation is expecting turnout of 300,000 visitors and total transactions of at least Rs 100 million during the five-day event. The festival showcases a plethora of Nepali and South Asian products in over 200 stalls. KATHMANDU, March 16: The 6th Nepal International Trade Fair is beginning at the Bhrikuti Mandap Exhibition Hall in Kathmandu from Thursday.